“whee”). What’s different about it, as you may have read, is that the game machine has a motion-sensitive controller that reacts to your movements and allows you to get some exercise while you play a video game. 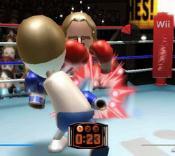 The game comes with five sports: tennis, golf, bowling, baseball and boxing. You move your remote controller as if it were a baseball bat, and you feel as though you are actually playing baseball. It becomes a tennis racket when you’re playing tennis. 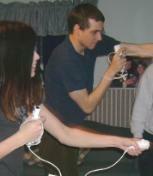 You hold two controllers when you box. Joy felt her pulse race and got as sweaty as a jogger when she knocked out nine opponents in 30 minutes. She was finally decked by a dude from New Jersey. You can stand up or sit in a chair and still get a great upper-body workout. We found ours at Amazon.com for $354.